“There are three different words in Japanese language for ’clothing’: western clothing, Japanese clothing, clothing in general, but this word can mean both lucky and joy. When people ask me which of these values suits my clothes, I reply that I create joy” – Issey Miyake. 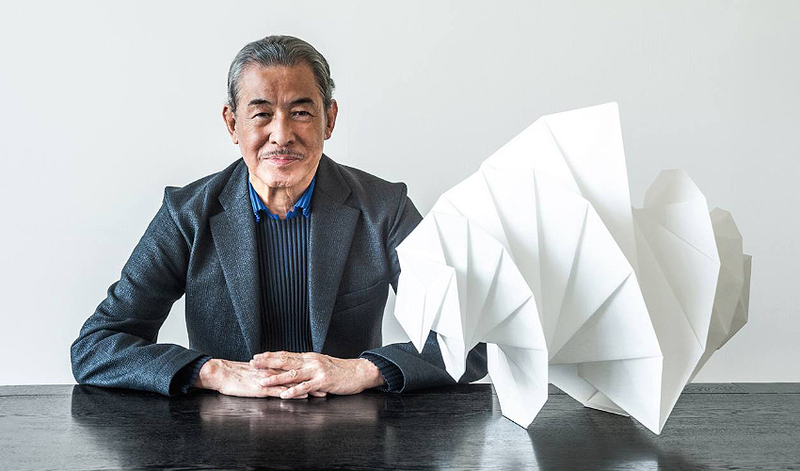 Issey Miyake is a famous Japanese fashion designer, the founder of his own fashion brand, the first fashion designer from the land of the rising sun who received recognition in Paris. Born on April 22, 1938, in the Japanese city of Hiroshima. The boy’s father died at the military front, and Issey himself miraculously survived the American atomic bombing of Hiroshima where he lost almost all of his family when being just seven years old. 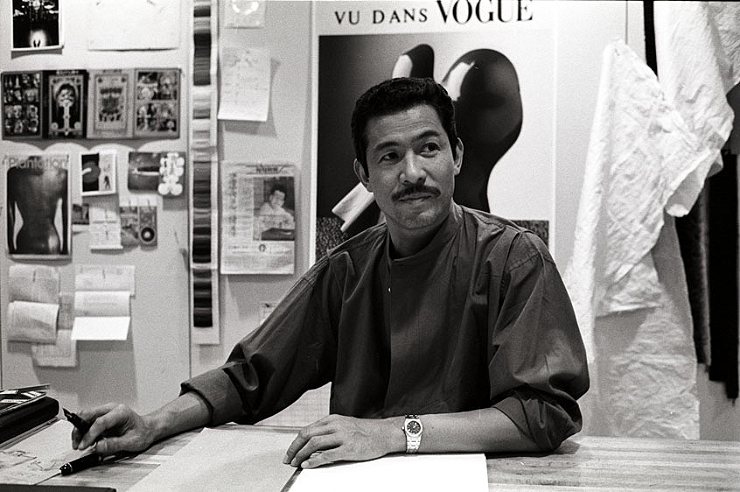 In 1959, after finishing the art school, Issey moves to Tokyo, where he studies at the graphic design faculty of the prestigious Tama Art University. In 1963, introduces his debut collection called 布と石の詩/Nuno to ishi no uta (Poems of cloth and stone). In 1965, continues to comprehend the craft of creating clothes at ‘École de la Chambre Syndicale de la Couture’. Receives a diploma with honors in 1966, and gets a job offer as an assistant in the fashion house of Guy Laroche. A year later, the young man starts working for Hubert de Givenchy. 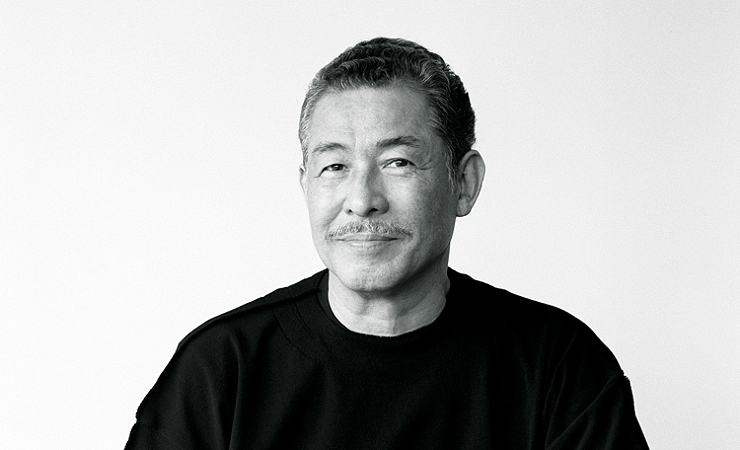 Some time later, Issey Miyake decides to move to the world of the popular culture and pop art – the United States, where he lives in New York and works as a stylist in the studio of the fashion designer Geoffrey Beene. However, later Issey decides to leave the United States and returns to his homeland. After returning to Japan, with the help of his friend Tomoko Komuru, Miyake begins to work on creating his own brand – Miyake Design Studio. A young fashion designer popularizes American version of fashion, which is to create “clothes for people” – simple and comfortable, like a knit shirt and jeans. 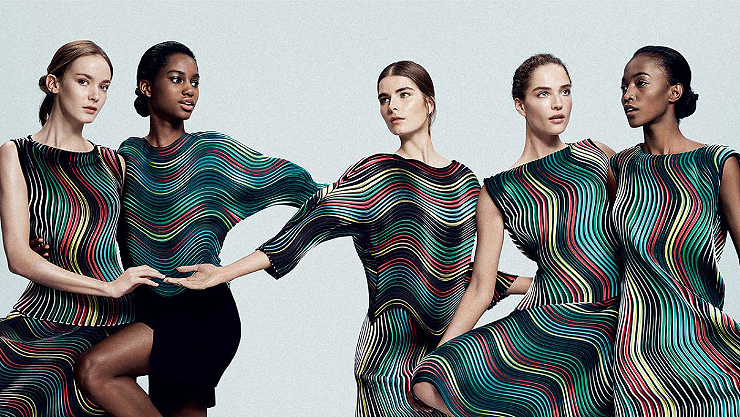 In 1971, Issey Miyake presents his spring-summer collection under his own brand name. In 1973, takes part in Parisian and New York fashion weeks. The very first models created by Miyake impress the public because unlike any other it was fundamentally new. The designer borrows a desire for comfort and versatility, multi-layered and free wide cut from the Japanese traditions of costume. He is attracted by geometric shapes – rectangles, squares and circles. The fashion designer likes to experiment with the clothing which consists of folds, corrugations and bends. 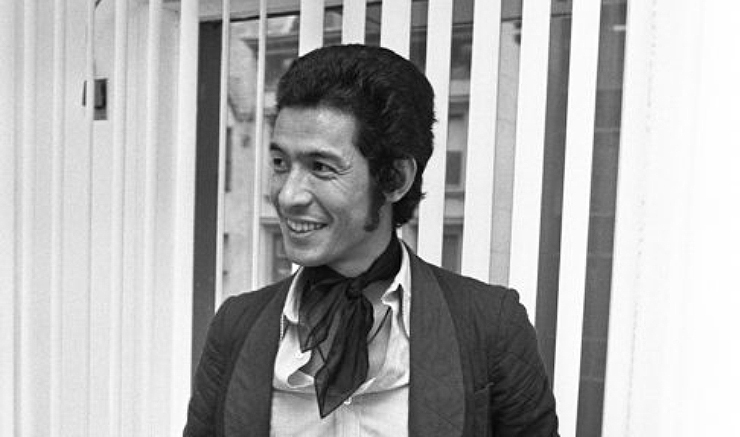 In 1976, Miyake starts to work on his own modeling concept called “A Piece of Cloth” (A-POC), the main idea of which is that a usual piece of fabric can be wrapped around the body, cut, thus turning it into different and unique pieces of clothes. Such an outfit will suit anyone regardless of the body type, and will be comfortable when moving, as well as create a feeling of comfort and freedom. In 1988, launches his new collection named ‘Pleats Please’ where uses the latest technology of pleating that he invented it himself. The designer suggested placing the ready-made clothes between two paper layers and then press them with a heat press. After this procedure, the fabric retained its folds. In 1992, the designer creates his perfume called “L’Eau d’Issey” for which he picked up a light aquatic-floral fragrance associated for him with moments of happiness. The bottle, designed by Miyake himself, is based on the view of the moon behind the Eiffel Tower from his Paris apartment. In 1998, finally launches his new collection based on the concept A-POC which he started to develop yet in 1976. 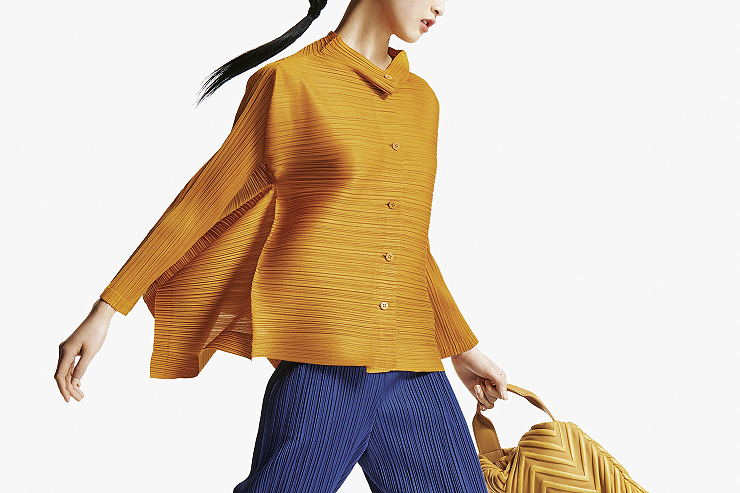 Miyake often takes inspiration from traveling to different countries, and the results of that can be clearly seen from his use of traditional Japanese prints or rich colors of Morocco in his collections. A well-known Australian artist and his long-term friend, Lucy Rie, presented him a collection of antique buttons made of porcelain and ceramics, which were actively used by the designer in his new creations. Another interesting history fact is that Miyake used to be friends with Steve Jobs, and produced the black turtlenecks which became a part of Jobs’ signature style. Jobs mentioned that in his biography: ”So, I asked Issey to make me some of his black turtlenecks that I liked, and he made me like a hundred of them!”. Since 2007, Miyake spends 90% of his time on the development of his A-POC ‘clothing of future’, and appoints Dai Fujiwara to the position of the Creative Director of the brand. After the leave of Dai Fujiwara, the design duties were split between Yoshiyuki Miyamae appointed head designer of the women’s collection and Yusuke Takahashi designing the men’s line.